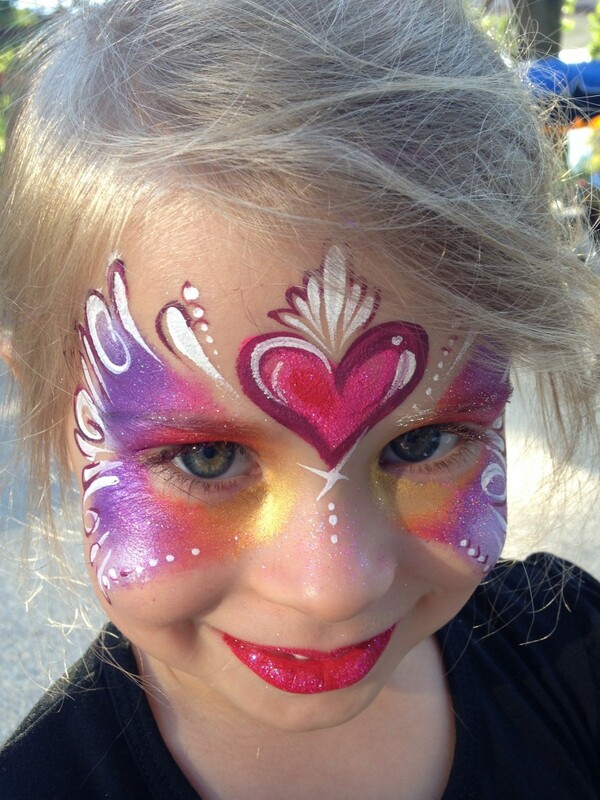 Established in 2010, Face Painting By Shelly LLC has been creating uniquely beautiful face painting art, fun balloon animals, fabulous glitter tattoos, and unforgettable magical memories at thousands of children’s parties, corporate events and festive celebrations throughout the greater NYC, Tri-State area, NJ and CT! People are constantly blown away by the incredible artistry, professionalism and amazing customer service of our fabulous, fantastic professional face painters and balloonists. We now travel to Westchester and Rockland County too - Let us design the perfect party for you! Fantastic addition to my party! Face paint by Shelly was awesome! Shelly, herself, got back to me quickly and was so sweet. She answered any questions I had. I had Gladys as my artist and she did a wonderful job! All my guests were complimenting on how great she was. Her face painting and balloon animals were a hit! For my next party I will definitely be contacting Shelly! Thank you so much for taking the time to write such a sweet review for us, and for your kind words! So glad you liked Gladys YAY!!! And yes, we look forward to seeing you again next time! Lots of love from Face Painting By Shelly, and thank you again for everything Andrea!!!! The best part of Sydney's party! We had the amazing opportunity to work with Shelly for our daughter's 1st birthday. She is so talented! After seeing one face painted, a line wrapped around the park! Even my mom wanted her face painted and she looked gorgeous! We were so impressed not only with her ability, but also her professionalism and ability to work with the kids and adults who were so eager and excited. Anytime we do a party for Sydney, we will be calling on Shelly! We hired Shelly Luan for my daughter's birthday party last Saturday. Shelly is a genius face painter, very reasonable and extremely sweet. All the parents at the party asked me for her name because each of her designs was a like miniature work of art. Her minions from Despicable Me were so perfect you couldn't tell if they were a tattoo licensed by the movie company or hand-drawn. Shelly loves people, especially children. She herself is a lovely and ever-smiling kid. I have seen her facepainting kids with exuberant giggles, loving smile and sweet gentle brush touches tirelessly for hours without taking a break! Kids and parents often line up a long queue just for their turn. Shelly once extended her facepainting almost half hour (without pay) just to cover the last kid who had been waiting faithfully to get a rainbow butterfly on her little face! Kids' and parents' praises, compliments and appreciation pour in from everywhere. As her friend/colleague of 20+ years, I would recommend Shelly with my heart glowing in delight and two thumbs up! Shelley wasn't available for my party so she booked her top artist Julie who was amazing! She arrived about 20 minutes early to set up, and during some down time she twisted balloons for the children. Her work was amazing and she super accommodating by staying an extra half hour for the late comers. I would definitely recommend her and would book her again for another party. Thanks Julie! Shelly was the hit of my one year old's birthday party! She was on time and was able to set up quickly and get to work creating masterpieces on the kids and adults! The artwork was beautiful and she is so creative! We told her that she has to be a part of every birthday now! I can't say enough and am looking forward to working with her again. XOXO!!! Shelly is one of a kind!!! Shelly was at our 4th of July party a few months ago and what she did was out of this world. The faces and tattoo designs she created for our kids were amazing, beautiful, original and very professionally done. The beauty was indescribable. All the kids were happy, their parents were happy and long after the party the people were still leaving compliments for Shelly's work and asking to bring her back. And we are bringing her back for Halloween. Thank you for everything Shelly! Shelly was such a delight to work with from start to finish. She did face painting and balloon twisting for my daughter's first birthday party and she was such a big hit! The kids kept her busy until the very last minute! Would definitely hire her again for all future birthday parties. This is the second year in a row we have hired Shelly to provide entertainment at my daughters birthday party. The work she does is fantastic and all the children (as well as their parents) were really excited about the incredible face painting she did. She is very professional and for the caliber of work she does, a great value. Shelly is the go-to face painter for our family! We are a multiple repeat customer for birthday parties and school events, as are several of our friends. She is wonderfully talented, her painting is beautiful artwork. She is kind to the children and has always been a great communicator with me, for scheduling etc. Shelley was amazing! We hired her to face paint at our 4 year old's party. She was professional and thoughtful in her communication to set up the gig, and everything went off exactly as we discussed. She was right on time (maybe even a few minutes early) and got to work with the kids right away. She was friendly and sweet to the kids and lovely to the adults too. She worked fast enough for kids and adults to get beautiful painting during her time with us. Everyone was really astounded by the quality of her work, we got compliments from other families in the park that day and our family still talks about how this was the best face painting they have ever seen. We really felt we got our money's worth, Shelley was a great addition to our party. I highly, highly recommend her. Shelly was early, enthusiastic, the kids were comfortable with her and she is an incredibly talented artist. Our guests were raving and the kids were delighted with their fancy faces! I have had one of Shelly's business cards on my refrigerator for the past 6 months hoping to use her services soon and I finally had a reason to use her, it was my son's 4th birthday party! She did a WONDERFUL job. She arrived early to set up and she did very well with each childs facepainting. She also made balloon characters for a few of the kids as well :) I could tell from her previous pictures that she was good but she exceeded my expectations. She is such a sweet lady and does very well with the kids. Each child left happy and got exactly what they wanted. Shelly you are super talented. Thanks so much! I will be using you in the future and recommending you to anyone that I can. My Amazing Experience with Shelly!! Shelly was not only patient, kind and very sweet to all those who attended our party (adults and children), she was an amazing artist. Any idea for painting that the kids had she produced without any problem. She made beautiful balloon animals and entertained kids of all ages. I will definitely hire her again in the future. Her face painting was perfect!! She's truly a gem and a very talented, kind lady. We had the privilege of having Shelly at my daughter's first birthday party. She was AMAZING!! !..to say the least. She was professional, prepared, great with the kids, patient, and so artistic….I have never seen such detail and creativity in face painting. She also did balloon twisting at the tail end of the party, and even remembered to make an adorable balloon flower for the birthday girl as we were packing up the party, so very sweet of her. She even came prepared to do tattoos on the children, but we didn't have enough time. I would hire her again..and again…and again!! But, with more time!! Shelley was amazing! In lots of ways! I picked a face painter for my sons 1st birthday as I thought it would be appropriate entertainment for the children of many ages. I could have never imagined how great of an artist I found in Shelley. Her work was fabulous! She was conscientious, SWEET, patient and very good with the kids. She was punctual and very friendly. People were floored by her work. I'm telling you she's the best! You will not be disappointed. You may think that face painting is just for kids, but think again! We hosted a Day of the Dead party for our adult friends, and Shelly turned all of our guests into sugar skulls for the night. It was an amazing transformation that will not soon be forgotten! Shelly is an absolute professional, an extremely talented artist, and also the sort of friendly, kind person who instantly puts everyone at ease. We would hire her again in a heartbeat. Shelly and her assistant were really fabulous. They worked very quickly but with no sacrifice of detail. She was totally open to suggestions and willing to combine images to give you the face you wanted. Shelly did face painting and balloons for our son's christening. We had about 12 kids from ages 2-6 and they all had an amazing time thanks to her. Their faces looked great and the balloons kept them entertained while they were waiting. I would definitely hire her again for another party and highly recommend her to friends. We hired Shelly to provide face painting and balloon art for my daughters first birthday. We had a bunch of kids there ranging from 1-5 years old. They all really enjoyed the work she did and so did we. Shelly works very quickly (without compromising quality) and made sure that every child was taken care of. We will definitely hire her again and highly recommend her services. We hired Shelly to work a corporate event in NYC. She was on time, professional, and extremely talented - the kids loved her! By the end of the event, every child had their faces painted beautifully, and the parents were thrilled. We gave Shelly six pictures of characters we wanted her to mimic the day of the event. She did a wonderful job creating them and was also willing to send us samples before the party began. She was a pleasure to work with and I would recommend her for any party. Thanks Shelly! Shelly = Best Party Face Painter in NYC! I hired Shelly for a themed birthday party this past summer (2013), which required a talented face painter. (The them was Cats.) Shelly was professional, on time, in demand, and everything about her services worked out perfectly. I would highly recommend Shelly. Shelly did spectacular face painting at our daughter's 4th birthday party. She was lovely with the kids and her work is far more artistic and creative than most of the face painters you find around the city. The kids loved it and all the parents were impressed. Shelly did our son's 2nd birthday party. From the start she was sweet and responsive. I told her he is obsessed with cows, and she actually learned how to paint a cow face and twist a cow balloon!! I loved that. She showed enthusiasm and professionalism at every step and was communicative leading up to the event. On arrival she was friendly and quick! (Both pluses for kids!) She's great with kids and clearly loves what she does. I've recommended her to everyone I know. We'll be seeing her again! If your looking for someone who thinks "out if the box" and not only does face painting but also has many other skills and adapts to your situation. Shelly would be a fantastic person to have around. She pays attention to what the kids are into and really goes above and beyond what she is hired to do. Shelly is an amazing artist and incredibly patient with kids. Face painting was a huge hit at my 4 yr. old's birthday party. Shelly will be the highlight of your party! We saw how good Shelly was in one of the kids bday party. Then we reached out to her for our baby's birthday party. Her face painting is the best. All the kids looked adorable. She made balloons too and all the kids loved it. Shelly will definitely not disappoint. Shelly did face painting and balloons for my daughters 5th birthday party. It was a princess themed party, and the girls loved her. She is great with children and did such an amazing job! She is very talented. I would recomend her to anyone. Shelly was amazing with the children!! So warm and caring! She made our daughters' 5 and 7 year old party so much fun! The kids were thrilled with the face painting and fun balloons! Many other parents wanted her contact info afterwards. I highly recommend Shelly and will definitely ask her to come to our future parties!!!! Shelly is GREAT!!! She is a very sweet person and was very good with the kids at my party. She was willing to squeeze every minute of the hr I booked to paint as many faces and make cute balloon animals for the kids. Definitely would recommend her for all my friends!!! Shelly is wonderful! She is on time and children friendly. Shelly has a warm and sincere spirit. She's efficient and consumer driven. The parents and the children were pleased with her mannerism and professionalism. She is the person to hire; you won't be disappointed. Oh, and the price is right. You can't get a better package...quality, professionalism and a warm and caring individual. I hired Shelly as entertainment for my 1 year old 1st birthday party last week. Shelly absolutely blew us all away great Is an understatement. For her rates you wouldn't expect her to be as great as she really is. She had the munchkins at my party running around looking like the actual spider man, lion, princess, anything they may have wanted. She actually love what she does and her goal was just to make the children happy. I absolutely will be using Shelly again and so will my friends and family. I highly recommend Shelly. THANK you again Shelly you were amazing and your wonderful personality and generosity was a plus keep up the great work. I had Shelly at my daughter's birthday party and everybody loved her! She was great with the kids and extremely patient. It was a princess-themed party and Shelly was well-prepared with plenty of theme-related designs for the kids to choose from. The results were beautiful! Would definitely use her service again. Shelly did an amazing job at my son's 4th birthday party in Riverside Park. She was prompt and had a great disposition. The kids loved Shelly's face paintings and waited patiently (!!!) in line to have their turn. Shelly even stayed longer than we had originally planned so she could finish making balloons for all the children who wanted one. I would highly recommend Shelly for any event. Fantastic, Easy-going and great with kids!!! We hired Shelly for my daughter's birthday party and she was so great. The party changed venues at the last minute because of weather and she was very flexible and quickly met us at the new location and got set up right away. 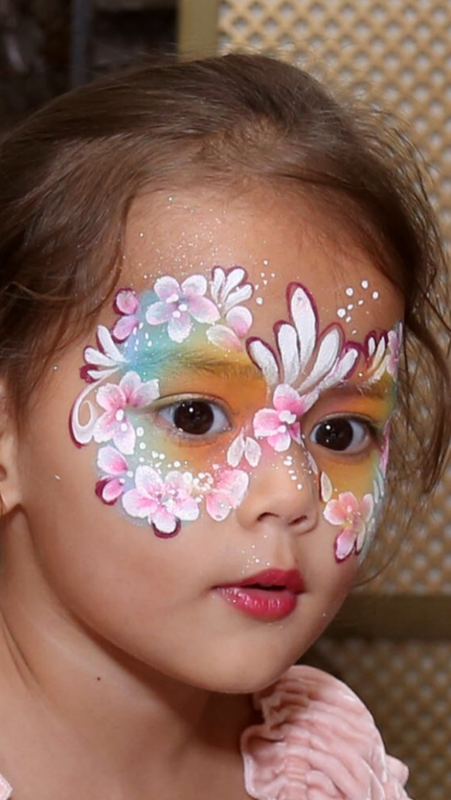 She had about (30) 3-5 year olds waiting for face painting and she managed it AMAZINGLY. She never got flustered or impatient and somehow managed to keep them all calm as they watched her paint magic on each child's face. She did an excellent job and we would definitely hire her for the next party. It's art, it's beauty, it's life, and above all - it's LOVE. The face painting by Shelly started on a park green with her Love of painting and children, and the word of mouth spread so rapidly that Shelly is already too busy to advertise. Every face painted is an image of wonderland. Every child decorated is an enchanted soul of glowing spirit. And the artsy face photo taken by the parents become a perpetual memory of "golden moment" in a lifetime. Shelly has sold her arts and paintings in the most demanding artistic environment of french Province, designed color styles to the highly particular tastes of Marseille residents in south France... now back to "innate joy of her heart" as she said, painting the faces of miraculous NYC kids - what else can be more rewarding? I would let her paint my own face one day and add the photo here. Shelly's spirit, life story, and art history are compatible with trees, flowers and stars, a willingness for perfection, a legend of seeking truth at all costs, a reflection of Light that shines with faith, hope, LOVE. Fabulous and Fun Face Painter, Kids Love Her!! Shelly did such a wonderful job at my girl's birthday party a couple of weeks ago. Besides her considerable skill as a face painter, she has a very special way with kids, and was able to make it fun for everyone, even some of the kids that were initially skittish. She's a perfect addition to any kid's party, and I'm so happy to have hired her, will definitely use her again next year. Talented facepainter, great with kids! Shelly volunteered at our neighborhood school where she did face painting to raise money for the school. She listened patiently to the kids' requests (spiderman, princesses, dragon, butterfly, etc. ), and made beautiful faces. The kids were delighted, and the parents were able to take great pictures. Awesome face painter and great with kids! We really enjoyed having Shelly help us make Max's party extra special. She was great - she took charge, showed incentive and were really, really wonderful with the kids. We will definitely recommend her to anyone looking for a face painter/party entertainer. Shelly worked my daughter's second birthday and she was wonderful! She has an incredible ease with children and always kept her cool- even when there was a line. So professional. Her painting is beautiful and she can make all kinds of images. Everyone was thrilled! She really added something special to the party! 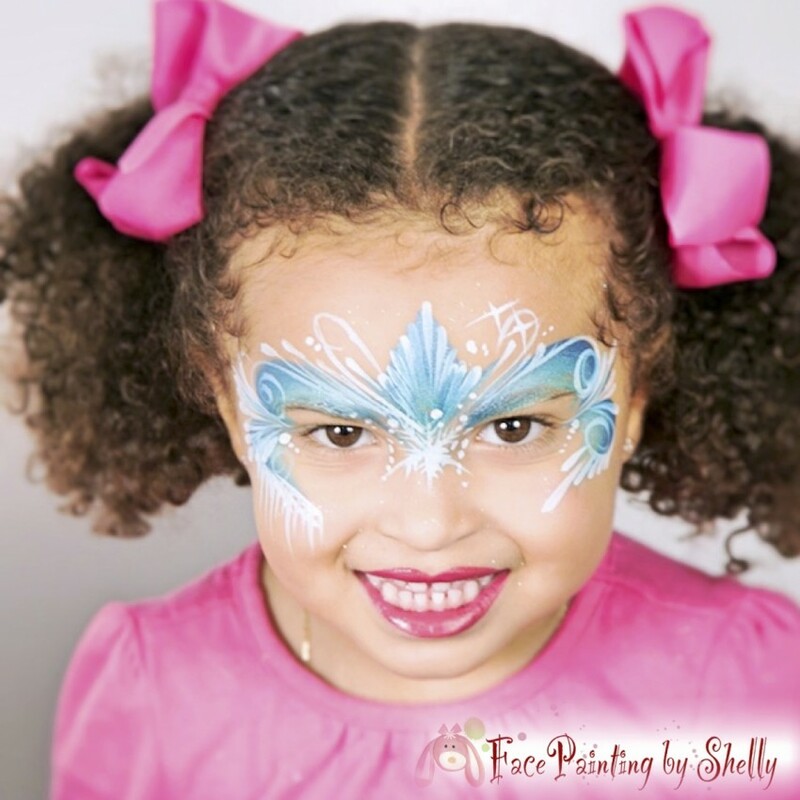 Whether you're hosting a birthday party, public, private or corporate event, holiday party, store opening, launch party or bar mitzvah, Face Painting By Shelly will be sure to instantly create happy, joyful atmosphere and guaranteed satisfaction to all your guests, making your event the talk of the neighborhood! Coming from a fine art background, Shelly Luan, at that time a school teacher and passionate educator of youngsters in Manhattan, had the idea of combining her artistic sensibility and love for children, to create this one-of-a-kind NYC kids birthday party addition, providing exceptional high quality entertainment services by painting uniquely beautiful, colorful, fast and elegant designs on these adorable little faces and arms! Please provide us with a regular height table, two chairs, sufficient room to work and some good lighting, thank you! Just provide us with a table and two chairs, sufficient lighting and some room to work, and the artist will bring all the rest to perform her magic!